Seattle’s Tess Henley began training under the Suzuki Method for piano at age three and by age five was dissecting harmonies that even her mother – a singer by trade – found difficult. She’s honed her live skills opening for folks like Jill Scott and Anthony Hamilton and playing her own solo shows while also building her profile as a songwriter. 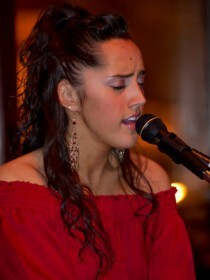 Henley’s single “Boy In The Window” from her 2010 EP, The Appetizer, earned a 2011 Independent Music Award for Best R&B Song, won the 2011 International Song Competition for SoulTracks.com (the largest soul site in America), was awarded top 3 honors in the prestigious John Lennon 2011 International Songwriting Competition and was featured on the soundtrack for 2012’s Hello I Must Be Going starring Blythe Danner. After Dice Raw from The Roots heard her music, he took an immediate interest in the young talent, taking Tess under his wing. He brought her to Philadelphia – the epicenter of a soul sound all it’s own – and introduced her to fellow-producer Khari Mateen (The Roots, Jill Scott, J*DaVeY). Dice and Khari signed on to produce Tess’s debut album High Heels & Sneakers (released May 2013). The album was recorded at legendary arranger Larry Gold’s “The Studio” over the course of a year and features 14 new songs, including the first singles Daydreaming and From The Get Go.